"These essays show what wonderful transformations can happen when teachers are able to nurture spiritual and emotional understanding as part of the lessons they teach." 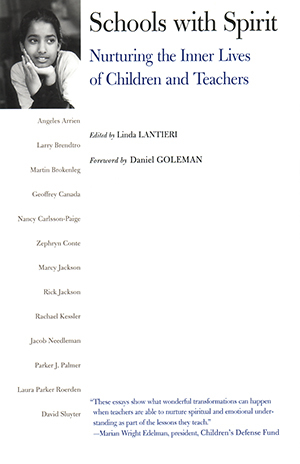 "This important book on teaching spirituality in American schools may serve as a significant resource for school teachers and administrators who want to help their students cultivate a sense of spirituality. . . . Teachers who struggle to reach this difficult equilibrium will welcome the wealth that these essays have to offer." "This book consistently encourages teachers to be courageous and deeply engaged in teaching students, bringing their entire selves, including their spirituality, to their teaching." "[Schools with Spirit] illustrates the importance of meeting the emotional and spiritual-as well as intellectual-needs of students and teachers." "In times focused upon high-stakes assessment and achievement of standards, it is critical to know that educators are equally concerned with the emotional, social, and ethical growth of students. This book is an excellent resource for all those who daily help students form caring relationships, make positive connections, and understand the strength of the human spirit."